I blogged about Christmas Eve’s I spent with one of my aunties and her family and the lefse I learned to make from them back in 2011 after I converted the lefse recipe so I could make the traditional Christmas Eve meal again. Since then, I haven’t even mentioned the rest of the meal or shared those recipes with you. I had to share the mashed rutabagas because who else makes them? I never hear anyone else talk about mashed rutabagas, let alone this unassuming root vegetable from Sweden from which they are made. Maybe the neep has gotten a bad rap for releasing cyanide which then turns into thiocyante which can be a thyroid disruptor and cause goiters. Maybe people can’t get past the bitterness of the root and don’t try to play with it. Maybe no one ever made them rutabagas and so they pass by them in the grocery store without notice. The horror! Potential thyroid issues aside, I love rutabagas. Not quite like I love potatoes. But I definitely start wanting them once Winter rolls around. I attribute that to the miraculous phenomenon that occurs when you practice eating what is in season. You want it when it is in season and then the rest of the year, you’re too busy with other produce to think about your Winter love affair. And all those cruciferous vegetables that I was told not to eat because of my thyroid? I still eat them in moderation and mostly in season. This is why I’m okay with eating rutabagas a few times a year. I may make these once more this season and then patiently wait until December rolls around again while I enjoy the bounty of the Spring, Summer, and Fall seasons. Place the rutabagas in a large pot and cover with water and a healthy pinch of salt. Bring to a boil and then simmer on a low boil for one hour. The rutabagas will be fork tender long before an hour is up, but you want to keep cooking them until you don’t smell so much of the bitterness and they are a bright orange. Drain the rutabagas and return to the pot of you are using stainless steel or to a large bowl. Add salt and pepper to taste, olive oil, and Earth Balance (if you can have dairy, use butter, or if you want to avoid all types of butter, use 1/2 cup olive oil). Mash together well. 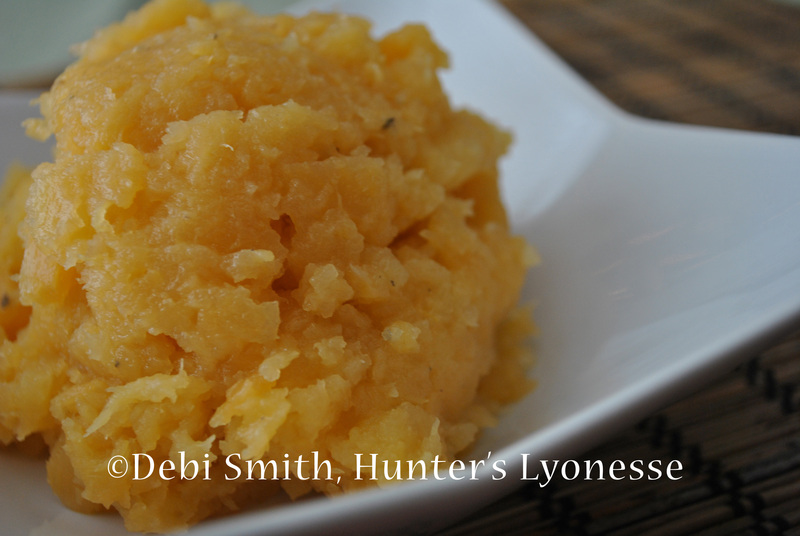 Stir the rutabagas with a spoon when you are done mashing to ensure everything has blended well. This post is linked to Wellness Weekend at Diet, Dessert, and Dogs by Ricki Heller. This entry was tagged dairy-free, egg-free, gluten-free, mashed rutabaga, neep, olive oil, rutabaga, soy-free, Sweden, thyroid, turnip. Bookmark the permalink.